As someone has called Leonardo da Vinci "the great Italian Yankee," because of his multifarious and ingenious suggestions in the world of material things, so our own Edison may be called "the Yankee Leonardo," for, with a curiosity ranging over the whole world of nature, equal to that of the Italian, and with a fecundity of invention no less bewildering, he unites, like Leonardo, an imaginative and poetical vein that lifts his devices into the domain of Art. Yet Edison is in no respect a graceful or romantic figure such as Leonardo was. He reminds us rather, by the weird and cosmic nature of his speculations and inventions, of some one of the beings created by the Norse mythologists: a nineteenth century gnome, rough, shaggy, uncouth, wholly absorbed in his search among the secrets of nature, and, while working always for the good of mankind, dwelling in a world apart, and with neither time nor inclination to mix in human affairs. 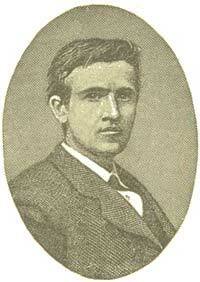 Thomas Alva Edison was born at Milan, Erie County, O., February 11, 1847. He started in life hampered by poverty, by want of teaching and training, without friends outside his own home circle to encourage him in pushing his fortunes, and with small opportunity, in the little village where his lot had been cast, for bettering his condition. On his father's side he came of sturdy Dutch stock: the old man, who was still living in 1879 at the age of seventy-four, reckoned among his immediate ancestors one who lived to be one hundred and two years old, and another who reached one hundred and three. He would appear to have been, like pioneers in general, ready, if not obliged, to turn his hand to any employment that might yield a living, that must be scanty at the best; and we read of him as in turn a tailor, a nurseryman, a dealer, first in grain and then in lumber, and an agent for the sale of farm-lands. He seems to have been unable to do much for his boy beyond teaching him to read and write, stimulating his taste for reading by paying him small sums of money for every book he read through; he had no need to insist that the reading should be done thoroughly, for it was the boy's way to do thoroughly everything he undertook. His mother, also, helped Thomas in learning: she was of Scotch extraction; but, though her parents were from the old country, she herself was born in Massachusetts, where for a time she had been a school-teacher. This, then, with the exception of two months at the village school, was the limit of young Edison's education--to use the conventional term. The world was now to take him in hand, and show what it could do with material so unpromising. Before he was twelve years old, the boy had found a place as newsboy on the Grand Trunk Line running to Detroit. In the intervals between his raids upon the helpless passengers with his newspapers, periodicals, novels, and candies, he kept up the habit of reading, and by practice acquired a remarkably clear and finished handwriting. His next step was to secure the sole right of selling newspapers on the train, and he soon had four boys under him to assist him in the work. Having then bought a lot of old type from some printing-office, he rigged up a rude frame in one of the baggage-cars that served as a lumber-room, and then proceeded to set up and print a newspaper which he called the Grand Trunk Herald, and sold with the other newspapers. As he had no press, he was obliged to take off the impressions by rubbing the paper on the inked type with his hands. In some way, a copy of this newspaper found its way to the London Times, and the editor spoke of it as the only newspaper in the world printed on a moving train. During the fighting at Pittsburgh Landing in 1862, Edison printed off abstracts of the telegraphic news, and posted them up at the small country stations, thus rendering a great service to the people anxiously waiting for news from the field. The terminus of his train was Detroit, and here, for the first time, he had access to a library. In his enthusiasm at finding himself in virtual possession of such a treasure, he determined, then and there, to read the whole library through, as it stood, using his time between trains. Beginning at one shelf he read fifteen feet in a line, going through each book solidly from cover to cover. In this first bout, among other books, he read Newton's "Principia," Ure's "Scientific Dictionary," and Burton's "Anatomy of Melancholy." Thomas A. Edison--The Wizard of Menlo Park. All this time, by hints and suggestions, Nature had been pushing the youth toward the field he was finally to occupy almost by right of eminent domain. As yet, telegraphy was in its infancy, and the powers of electricity only beginning to be known. Edison had from the first been interested in the workings of the telegraph line along the railroad, and had made some experiments with a rude line of his own, connecting his father's home at Port Huron--a village to which the family had some time before removed from Milan--with the house of a neighbor. To do this, he had to make a battery out of odds and ends, old bottles, stove-pipe wire, and nails made out of zinc contributed by his youthful friends, who in their zeal cut pieces out of the zinc mats under their mothers' stoves. He had no one to teach him telegraphy, but an accident--if accidents there be--was unexpectedly to put him in the way of learning its secrets. The child of the station-master was in danger from a moving train; young Edison snatched it up and saved its life at the risk of his own, and the grateful father rewarded him by teaching him what he knew of telegraphy. Armed with this rudimentary knowledge, and with what, in addition, he had learned by practice, Edison passed the next few years of his life in moving about over the country, seeking employment less, it would appear, for the sake of employment than for the opportunity of increasing his practical knowledge of the art that was to swallow up, in his mind, all the other arts. But he seems to have succeeded almost in spite of himself. He was so eager in his chase after knowledge that he was continually tripping himself up. 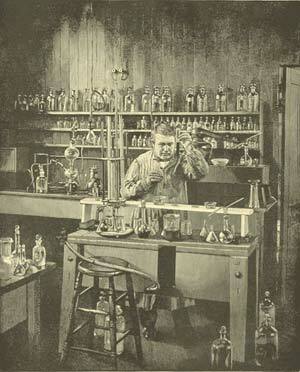 While still at his trade of newsboy on the Grand Trunk Railroad, he had come across, at Detroit probably, a copy of Fresenius' "Qualitative Analysis" and had become so much interested in chemistry, that alongside his printing-press he had fitted up a small laboratory with a chance-medley apparatus for experiments, and one day a bottle of phosphorus was upset, and the car taking fire was only saved by the energy of the conductor, who promptly pitched the whole apparatus, with the printing-press to boot, out at the door, and then gave the young Fresenius-Franklin a thrashing. Later we hear of him, in the course of his wanderings, set to watch a telegraph-machine in the absence of the operator, and to prove that he was on guard he was to send the word six over the line every half-hour. Not to be interrupted in the book he was reading, he contrived a device that did the work automatically. In another office he kept back messages while he was contriving a way to send them more quickly! Disappearing from this office, he appears again in another, this time in Memphis, Tenn. But his interest in solving the problem of duplicate transmission proved so absorbing that he continually neglected his duties, and on the occasion of a change of officers he was dismissed as a useless member of the staff. At Louisville he upsets a carboy of sulphuric acid which ruins the handsome furniture of a broker's office on the floor below, and again finds himself adrift in an unappreciative world. Yet he had proved himself, in spite of all drawbacks, an adept of uncommon skill in telegraphy; and so widespread in scientific circles was his reputation, that he was sent for to Boston to take charge of the main New York wire. The impression made by the records of his life at this time is, that he looked upon all these employments merely as so many opportunities for earning his bread while pursuing his beloved experiments, and that the bread-earning was the least important part of the affair. No doubt, he always meant to do his duty, but the ecstasy of invention and the thirst for discovery carried him out of himself and made him often oblivious of sublunary things. While in Boston he still kept up his experiments and perfected his duplex telegraph, but it was not brought into successful operation until 1872. In 1871 he came to New York, and having attracted the attention of the Stock Exchange by some ingenious suggestions put forth while busied in repairing the machine that recorded quotations, he was made Superintendent of the Gold and Stock Company, and brought out his invention of the printing-telegraph, by which the fluctuations of the stock-market in any part of the country are instantly recorded on narrow strips of paper. The immediate success of this invention, and the great demand for the machines, led him to establish a workshop for their manufacture in Newark, N. J. But soon the need of still more space, and the desire for freedom from interruption while at his work, obliged him to give up Newark, and he found new quarters at Menlo Park, N. J.--a bare plot of barren acres destitute of natural attraction of any kind, unless it be--what to Edison indeed is a great charm--an uninterrupted view of the sky; a place virtually unknown before he planted there the rude buildings that house his wonderful inventions; yet now a place known to scientific men all over the world; the Mecca of many a mind seeking to wrest from Nature her dearest secrets. No doubt, many of the inventions that have made Edison famous must be ascribed in their conception and ripening' to various periods of his life, but to the popular mind they are all associated with the wizard's present home, from whence for several years the bulletins of inventions--playful, useful, necessary, revolutionary--often as simple in their mechanism as they are astonishing in their results, have been given to a delighted world. Some of Edison's inventions have a character at present of little more than picturesque playfulness, such as the Phonograph, perhaps the most remarkable of these minor inventions; the Aerophone, by which sounds are amplified without loss of distinctness; the Megaphone, an instrument which, inserted in the ear, so magnifies sounds that faint whispers may be heard a thousand feet; the Phonometer, for measuring the force of the soundwaves caused by the human voice; the Microtasimeter, for measuring small variations in temperature. This has been tested for so small a variation as 1/24000 of a degree Fahrenheit, and in 1878 was used to detect the presence of heat in the sun's corona. The most familiar of these lesser inventions is the Phonograph by which sounds are made self-recording and capable of being repeated. While this curious invention--almost childish in its simplicity--is as yet little more than a plaything, and has proved of small utility, it makes, nevertheless, a strong appeal to the imagination when we reflect that by its aid the voice of any human being may be transmitted to ages far in the future, and its living tones be heard long after he who uttered them has returned to the dust. But, while these inventions have the charm that invests "the fairy-tales of science," the world-wide fame of Edison rests upon greater gifts to the world; the various improvements he has made in the telegraph, and the perfection to which he has brought the electric light. The invention of the telephone, by which persons are enabled to converse with one another at very long distances, and by which concerts, operas, and orations or sermons in one city can be heard by an audience assembled in another, is one of the most remarkable of Edison's achievements, and one the usefulness of which in various directions it is easy to foresee. The idea of the transmission of messages in opposite directions by the same wire was one that had early occurred to Edison, but he was long in reducing it to practice. The secret once discovered, however, he rapidly progressed until he had brought out the sextuple telegraph, where we believe the ability of the instrument rests at present. The inventor next turned his mind to the study of the electric lamp, in which he saw great possibilities. He believed that he could produce a light that should be cheaper than gas, and also purer, more steady, and more to be depended on. He rejected the principle of the Voltaic arc involved in the Brush patent then in use, by which the electric current was passed through a strip of platinum or other metal that requires a high temperature to melt, because in practice it was found that in fact, owing to the difficulty of regulating the flow of the electric current, the medium did often melt. He therefore sought for a medium that should be practically indestructible, and believed that it would be found in pure carbon enclosed in a vacuum. After many trials with one and another substance, he at length found that by employing slender strips of card-board reduced by intense heat to carbon, connecting them with the wires leading from the machine, and enclosing them in glass bulbs from which the air had been extracted, the desired result could be produced. The next step to accomplish was the division of the light, so that any number of lamps could be supplied by the same pair of wires--a condition absolutely necessary if the invention were to be of practical utility as applied to the lighting of factories, public buildings, or private households, where-ever, in short, many lights are needed. This was finally accomplished, and in December, 1879, an exhibition was given at Menlo Park of a complete system of lighting. This first demonstration of the possibility of light-division created a great interest in scientific circles all over the world, especially as scientific experts had testified before the British House of Commons that the feat was impossible. The Edison incandescent burner is now in use in every city, town, and hamlet in this country, and it would seem as if it must of necessity before long drive the costly, unhealthy, and dangerous coal-gas out of use for illuminating purposes, although we believe a wide field of usefulness lies before the coal-gas as a substitute for coal in our kitchens. Thomas Edison has received few public honors from his countrymen; but the nature of his work has been such as to make his name a household word throughout his native country; and not only by the admiration excited by his genius--for it deserves no less a name--but by the practical, every-day benefits he has conferred, he has earned a place in the good-will and esteem of his fellows such as seldom falls to the lot of man.